Glaze is a translucent paint used for a variety of decorative painting techniques. Valspar translucent glaze comes pre-tinted, or it can be custom tinted using latex paint. You can use glaze on a variety of paint projects, from smooth walls to heavily plastered ceilings, to furniture and cabinets. Remember to always experiment with sample boards prior to tackling a larger, more permanent project. Valspar glaze is a great way to add a decorative finish to many different items in your home. Use glaze on walls to create a color-washed look. Just be sure to mask off the wall(s) to be painted using 1-inch painter's tape. You'll want to apply tape to the baseboard, ceiling and trim, as well as any other items touching the surface to be painted. Remove all furniture from the room if possible, or cover with heavy plastic sheeting. It's also important to cover floors with drop cloths. Unscrew all outlet covers and place screws and outlets into a small plastic bag so they don't get lost. You can also use Valspar translucent glaze on furniture, cabinet or trim. Just be sure to paint over a drop cloth or outdoors to avoid dripping. 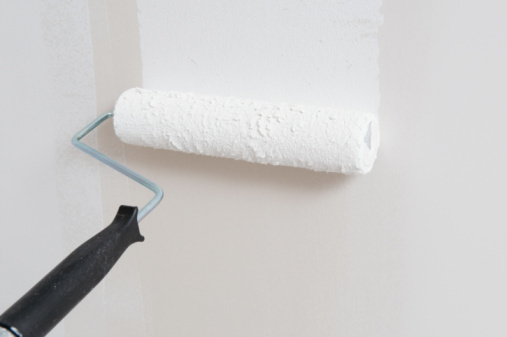 Before you start painting, be sure to wear disposable gloves to protect your skin during the paint process. You'll want to first apply a basecoat of the Valspar pre-tinted glaze. You can do this with a brush or a roller, depending on what you're painting. If you are painting your walls, use a short nap roller for smooth walls or a rough, longer nap roller for heavily textured walls. Any missed spots cannot be tweaked or adjusted after the glaze has been applied. Allow to dry four to six hours. It's also important to never go back over a glaze section after it has been completed, even if the glaze looks wet. This may streak your finish! Mix untinted glaze by combining paint and glaze in a 1:4 ratio prior to painting. Use a large 5-gallon bucket to do your mixing. Add the tinted glaze to a paint tray or bucket. Apply the glaze with a small brush or mini-roller. Roll the glaze on in organic patterns. Never paint in block or solid square shapes. Work vertically in sections no larger than 2 feet by 2 feet. It's always a good idea to make samples before attempting a large-scale project. Experiment with different base coat colors and glaze mixtures. Remember different tools, such as sponges, plastic bags and brushes, will create different techniques and impressions in the glaze. Manipulate the glaze as you work using a sea sponge, plastic bag, rags or paintbrushes. Dab and stipple the glaze to create a custom, organic pattern. Maintain the same pattern, rolling glaze and manipulating in small vertical sections, until finished. Never stop glazing until the section is completely finished—otherwise dark dry lines will occur. Don't forget to allow glaze to dry. Valspar glaze is surprisingly easy to clean up. Once you have finished painting, just soak your materials in warm, soapy water.